While bees and gardens normally go hand in hand, in the case of CastleVille's newest content update, the game's Gloom Bees are anything but productive. 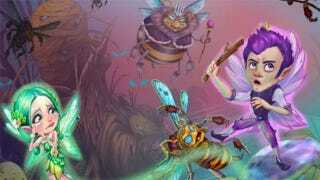 In fact, they threaten the very future of the Gloom Garden, so it will be up to you to complete a series of eight 'To Bee or Not to Bee' quests to help the Fairy Prince save the Fairy Gardens before it's too late. We're here with a guide to help you finish these eight quests, thanks to Zynga. This first quest is more of a tutorial than anything else, as it sees you clicking on the Portal Map located just above your neighbor bar at the bottom of the screen. From there, you'll see an option to travel to "Fairy Realm: Chapter 2," which houses this quest series. Clicking on travel warps you to this new expansion of sorts, and you'll receive 1,000 coins and 20 XP for completing this first basic quest. The Watering Cans are earned by posting a general request to your news feed, so be sure to play the game on Zynga.com long enough to post this request. That way, you'll earn these items from strangers in a matter of minutes, and won't actually have to wait for your friends to personally be active. As for the Bug Zapper Spell, this is found in the Spellbook under the blue "Celestial" category. It requires two Amber and two each of Red, Yellow and Blue drops to create. These colorful drops are earned by tending items with matching colors within Fairy Realm. Remember though, your Fairy Realm energy is limited to a maximum of 12 points at a time, with each point taking a very long time to recharge (as of this writing, it's 40 minutes per point). What's more, you unfortunately aren't guaranteed to receive a drop even when you tend a matching colored item, so keep that in mind. Once you've been able to cast the Bug Zapper Spell on a bee, it will stop flying and drop to the ground where it can be banished as normal. You'll receive 1,500 coins, 30 XP and a Support Quicken for finishing this second quest. The Healed Fairy Dens are those small fairy cottages that you can see in shadows within Fairy Realm. You'll need to cast Gloom to Bloom on each Den to heal it, with that particular spell requiring items like Beeswax, Red Feathers and even a stocked Falling Star quest to create. As for they Honey, this can be earned by tending flowers, which thankfully also count for the "nature" portion of this third quest. Finish this quest and you'll receive 1,000 coins and 20 XP. Hit 'Em Where It Counts! The Hive is a very large item at the back of the Fairy Gardens, and it requires building materials to "attack." You'll need four Bee Stingers, six Beekeeper Hats, three Wood Clubs and two Hammers to perform this first attack. Bee Stingers can be earned by attacking bees, while the Hats are earned through a general news item posted on your wall. As for the Wood Clubs and Hammers, these can be crafted back in your workshops outside of the Fairy Gardens. Finally, a single Ice Cream takes two hours, five Ice Chunks, five Milk Bottles and two Honey to craft, so make sure to tend some cows for the Milk as quickly as you can and stock up. Completing this quest gives you 1,750 coins, 35 XP and a Purple Fairy Flower decoration for your Kingdom. At some point during the attack, the Fairy Prince will be stung by a Gloom Bee, so your focus immediately shifts to healing him. You'll need to post a general news item on your wall to ask for the Aloe, while the Color Drops can be any color, and can therefore be earned by simply tending any specifically colored item within the Fairy Garden (a Red Flower, for instance). Finally, the Portal Energizer Spell is located under the green Nature section of the Spellbook, and it requires Aquamarines, Eggs, Sugar and more to create and cast. For completing this quest, you'll receive 1,500 coins and 30 XP.